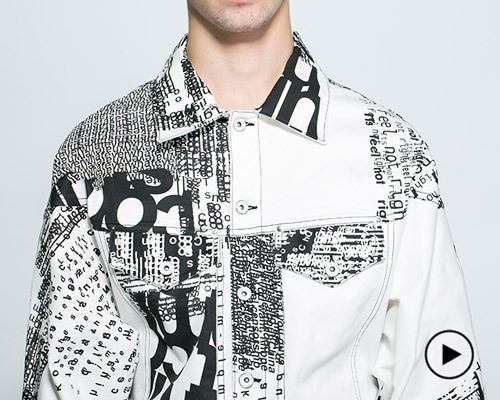 as a textile denim is timeless, iconic and continues to be reinterpreted by creatives. art installations, upholstery or advancements in production, here designboom gathers all news and projects related to denim, featuring names such as diesel, collaborations from LEVI's and projects from an array of other designers. 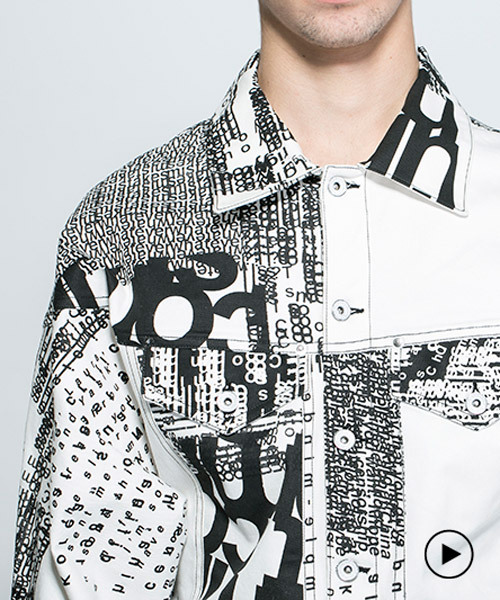 the black and white denim is covered with letters and words falling apart. 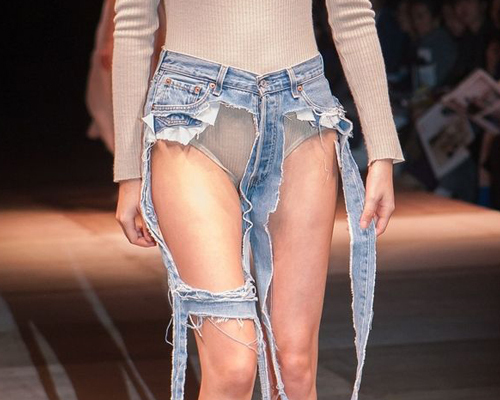 'thong jeans' are the most recent in a line of denim disasters and the latest love-to-hate topic on the internet. 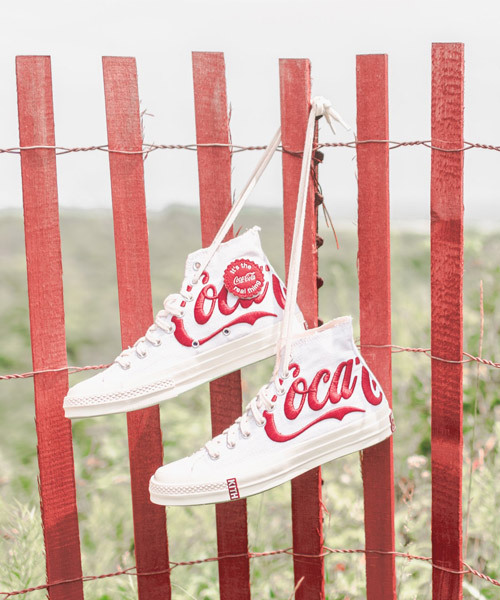 kith and coca-cola create 1,000 editions of converse’s ‘chuck taylor all star ‘70’, as well custom packaging including a kith x coca-cola 8oz glass bottle. 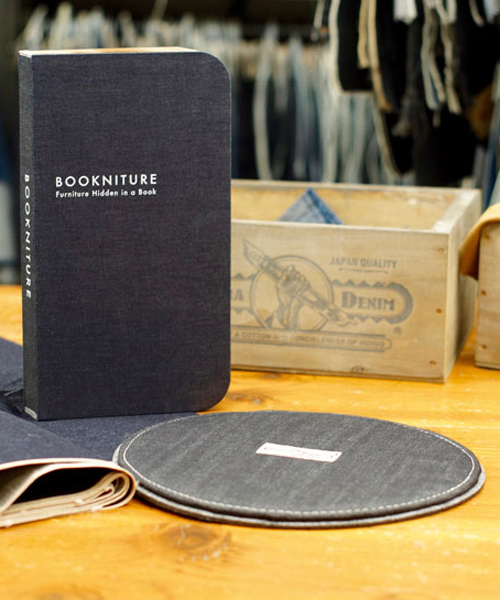 like the jeans' character, each BOOKNITURE piece is built to last with unique fading in line with the usage of the product. while the individual garments allude to the human scale, the meshed and twisted structure has been designed to evoke a sense of community. the techrules ren supercar's distinctive fighter jet-style canopy rises up, allowing people to access its modular three-cockpit layout. google X levi's garment, which uses conductive threads to turn levi’s iconic trucker cycling jacket into a smart wearable, takes center stage at SXSW 2017.
original red-brick walls, steel pillars, and wooden roof beams are worked into the functional layout, complemented with a muted concrete palette. denim texture is preserved on the exterior surfaces, allowing a familiar touch and aesthetic; the inside, however, has been polished to a super smooth finish that's comfortable and easy to clean. for the stockholm furniture fair 2015, swedese has collaborated with nudie jeans on a limited edition, denim interpretation of a design classic. the norton protected betabrand 'ready active jeans' feature RFID-blocking fabric to shield personal and credit card details from digital scanning devices. the animals bear their marks on the textiles, which are sewn together into a pair of ripped jeans. proceeds are donated to both the zoo and the world wildlife fund. jeans, t-shirts, sweats and caps are woven with bionic yarn, an eco-thread of fibers derived from recycled plastic bottles. the book reveals both the past and future of denim, from its production to the voices of those responsible for its evolution. 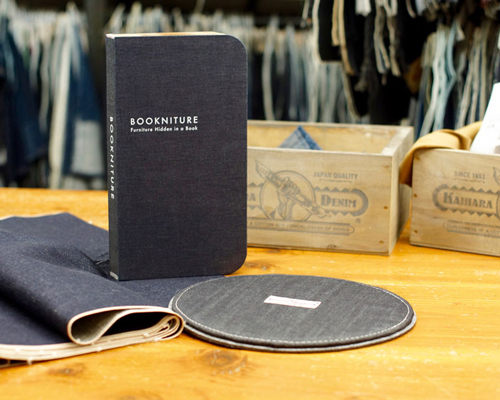 conceived as part of a post-recycled jeans initiative, denim rugs are produced out of worn-out and destroyed nudie pants. 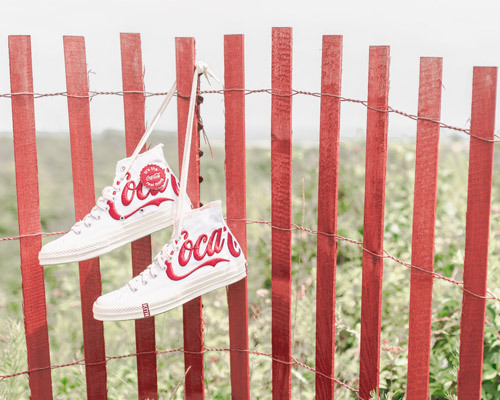 the composition of the material is made-up of recycled cotton and polyester in combination with three to five plastic beer bottles to produce each pair of denim. singporean furniture company dbodhi's goal is to seek ways to reuse, recycle and repurpose discarded materials into distinctive designs that make it easy for you to be environmentally friendly. the latest collection is utilizing the second-hand stores' surplus of denim found in indonesia, where dbodhi has its manufacturing facilities. the average pair of jeans uses 42 liters in the finish process, but this new line is meant to reduce water consumption by an average of 28 percent, and up to as much as 96 percent for some new products within the collection. 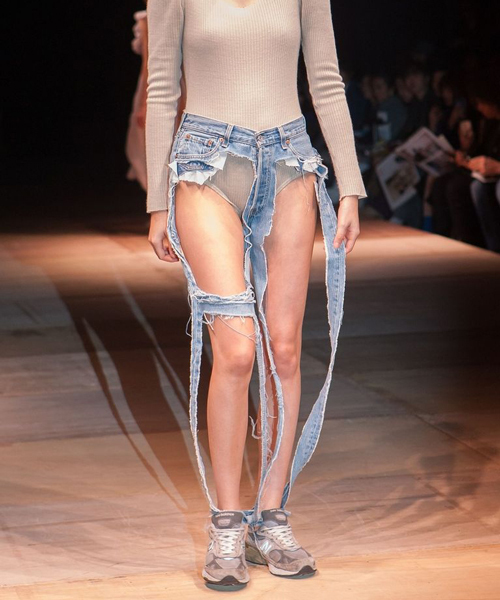 the concept of the event - 'denim' by première vision - retains itself as a niche show, bringing together the various professionals working in denim related industries. leading fibre producers, weavers, manufacturing / finishing and dyeing specialists, launderers and accessory manufacturers were in attendance. 'traveling denim' is a short film by takayuki akachi which documents how a pair of jeans fade and wear out over the course of a two year trip across fifty countries. shots of the jeans are interspersed with images of the different cultures and geographic terrains encountered along the way. the new LG X120 netbook is a levi's branded special edition notebook. introducing jeans stools created by dutch designer ciske van berkel.